People who refuse to register for the government's planned ID card scheme could face a "civil financial penalty" of up to £2,500, it has emerged. 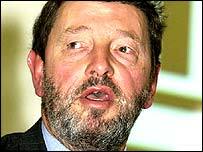 David Blunkett said not making registering a criminal issue would avoid "clever people" becoming martyrs. And he promised strict limits on the type of information stored on ID cards. Under Monday's draft bill, carrying false papers will be a criminal offence but MPs have until 2013 to decide if registration should be compulsory. Details of card holders kept on the National Identity Register will include name, address and previous addresses as well as nationality and immigration status. Mr Blunkett also confirmed that people will have the right to see their entry on the register. He said ID cards were needed to prevent the UK becoming a "soft touch" for terrorists. But DNA and other health information would not be included on the cards and there would be an independent regulator to control the type of information they contain. Legislation is expected to be introduced to Parliament in the autumn, with the first biometric passports, which store fingerprint or iris scan information, issued in 2005 and the first cards carrying fingerprint details in 2007. Ministers will make the final decision on compulsory registration by 2013, as detailed in the government's original timetable published in November. By that time, Mr Blunkett expects 80% of the population to hold biometric identification either in the form of a passport, a driving licence or a voluntary ID card. Asked whether members of the Royal Family would be required to apply for a card if compulsion is introduced, Mr Blunkett said: "We are all subjects and citizens." A trial of identity card technology was launched on Monday involving 10,000 volunteers. Ministers believe that as well as fighting terrorism, the cards will help to crack down on ID fraud, human trafficking and illegal working, as well as stopping people exploiting health and welfare services. Mr Blunkett claimed the biometric system would make UK ID cards impossible to forge - unlike cards used elsewhere in Europe. Liberal Democrat home affairs spokesman Mark Oaten said: "I would much rather see the £3bn that's going to be incurred in looking at better intelligence". Shadow Home Secretary David Davis said the Tories were sceptical about the home office's ability to succesfully introduce ID cards - but added the idea must be looked at "carefully". "The practical problems in the way of ID cards are immense. "If a scheme can overcome these problems without sacrificing civil liberties, ID cards should be introduced soon - not in ten years time. The terrorist threat is real, and is here today," Mr Davis said. The draft Bill sets out proposals for a national identity register to hold details of all 60 million people in the UK. This will enable a person's identity to be authenticated when they produce their card. The legislation also sets out safeguards to prevent government officials from misusing the data. As part of a large-scale test of the equipment, volunteers are having biometric details recorded, involving facial scans, iris scans and fingerprints. 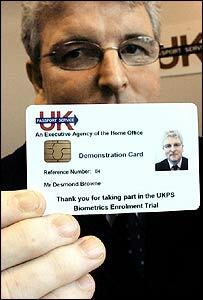 The biometric checks will become compulsory for anyone applying for, or renewing, passports from 2007. Are the public happy with the new ID scheme? If cards are made compulsory, they will have to be produced to access a range of public services including the NHS and benefits. The estimated £3.1bn cost of introducing the scheme will be met by increasing the cost of passports. Civil rights campaign group Liberty said the government was effectively introducing an identity tax. Liberty director Shami Chakrabarti said there were privacy implications, while no government had yet shown itself competent to manage such databases. The Home Affairs select committee said it would be placing the draft bill under close scrutiny. As part of the inquiry, the committee will take evidence from the Home Secretary David Blunkett MP on 4 May and will also be calling for written submissions on the draft bill as part of the process of pre-legislative scrutiny. People who want to take part in the trial should send an email to trial@mori.com. Facial scanning: A camera with appropriate software records face contours and converts them into code. A computer processes the data and checks against stored record. Iris imaging: Software scans a digital image of the iris to compare its unique pattern with all those stored. Fingerprinting: A scanner reads the ridge patterns and compares the converted code with those on a database.